Last week we received a Yogibo Max beanbag in the mail. It was huge and red and I want to say that it’s been all rosy and great since we got it, but the truth is, life hasn’t been easy since our chance to review a Yogibo Max arrived. Jealousy, reckless enjoyment and catatonic states have marked the arrival of this item. Our house has been in a constant struggle since the delivery woman dropped it off. Even the over sized box has lead to heartbreak. The question my wife and I ask daily is why did we get one in the first place. What were we thinking??? In truth, the Yogibo Max beanbag has been such a hit around the house that our only issue with it is that there isn’t one for all of us. The biggest stress has been getting to it before someone else claimed it as their own. If you know my wife, it’s no secret that she’s wanted a beanbag since she was little. When the Yogibo showed up on our doorstep, a giant check finally got marked on her childhood wish list. The next one is jumping into a giant ball pit. Well, that might be harder to find but the happiest I’ve seen her in a while has been her time spent on the Yogibo. The fact that she hurt her back this week means she’s even gotten the lion’s share of use from it the past few days. The Yogibo has been great at letting her lounge out without putting any stress on her back. Similar to going to the beach and carving out a sand seat for yourself, once you’re in the Yogibo you can add or take away the foam beads from behind you to give you as much support as you need. The only problem is staying awake and maybe getting out. We’ll get back to that last one in a bit. I really don’t think I need to talk about how much the kids love this beanbag, but I will. You see, they practically live on it. I know they’d sleep on it at night if I let them and my daughter even mentioned how we should just get rid of her bed and get her another Yogibo beanbag. Whether they’re jumping onto it from the couch, standing it up and hurling themselves at it at mach 9 or just sitting there reading or playing video games, the Yogibo, by squatters rights, is mostly theirs. They’re even content sharing it and that’s saying something right there. 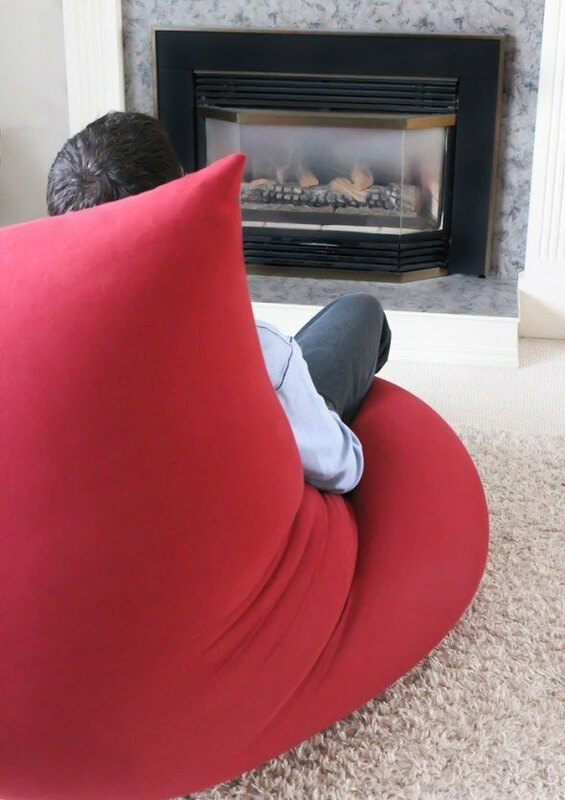 It’s no wonder these oversized beanbag are a huge hit with kids. They’re fun to play with! My wife isn’t the only adult in the house that’s always wanted a beanbag chair. I’ve always wanted one as well! No, I don’t have a giant checklist that got shortened the moment it showed up, but I’ve always been a sucker for comfort. The Yogibo has that in spades. Unlike a lot of other beanbags on the market these days, Yogibo uses foam pellets to fill their bags as opposed to ripped up foam material. What this means is a more comfortable experience as the beans mold around your body. 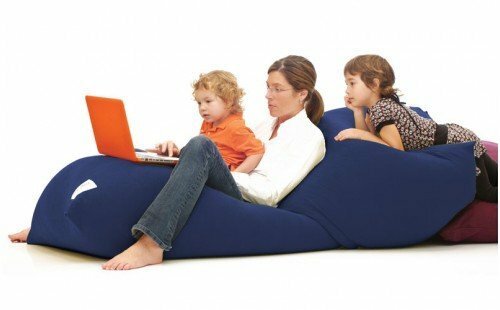 It also lets you use the beanbag in multiple positions that the larger foam ones don’t. With the oversized Yogibo Max you can sit it up and use it like a high-backed chair, you can lay it down and use it like a recliner or you can stretch it out and use it like a lounger. That last one is our favorite and it makes any beach lounger feel uncomfortable by comparison. The Yogibo Max is like an indoor lounge chair filled with comfort. It’s also big enough that a parent and a child can both lounge out side by side while another child sits on top or down by your feet. That alone has been it’s saving grace as both the wife or I can relax while the kids rotate around us like orbiting moons. Putting it sideways, it’s big enough that 2 kids can sit on it without danger of them touching each other and it’s big enough for 3 or even 4 of them if they don’t mind getting a little closer. I hate to say but it beanbags aren’t for everyone. Their biggest obstacle is trying to get out of them. It isn’t always the easiest. Especially if you’re trying to preserve your dignity. Of course, this applies to any beanbag and not only the Yogibo. That said, it can be really comical for the others around you. They’re also incredibly comfortable to sit on for a while, but we find that they’re a bit soft to sleep on overnight. We actually tossed around the idea of picking up a couple more and foregoing couches completely in the one room, however the idea of older relatives trying to get off of them made us laugh so hard it wasn’t really an option. That said, they’re not only a young persons toy. No matter which Yogibo product you buy, it seems they all have a few things in common. The ability to take off the outer layer and wash it is an important one for our family. With the amount of use it gets, it’s just a matter of time before something gets spilled on it. The fabric is also really stretchy which helps the beanbag conform to whichever position you place it. It also seems to handle friction well and though I was initially tentative about runs or pulls, it looks the same today as the day we got it. The fabric also appears to breath and the pellets stay really comfortable under you. They radiate just enough heat that your back and bottom doesn’t get cold and not enough to make you uncomfortable on a hot day. A nice feature about Yogibo products is you can also buy more pellets. Due to the fact that foam beads slowly collapse over time, especially when the kids use it like ours do, it’s nice to know that Yogibo sells extra pellets for when the time comes to replenish it. I can say that’s it’s held on remarkably well so far and my kids have definitely been putting it through it’s paces. The biggest plus about the pellets versus standard foam pieces is that it really cuts down on the weight. Even our youngest can easily stand it up and move it around without any problems. The other style of foam pieces more commonly used today greatly add to the overall weight and limits moving it around. In the case of quality, the Yogibo seems like a great product. Time will tell how it holds up but if these last few weeks are anything to go by, long term quality shouldn’t be a problem either. Some people might have trouble with the size of the Yogibo Max. There’s no denying it, it’s huge! If you don’t have the room for it, then it might be a better idea to get something a little smaller. 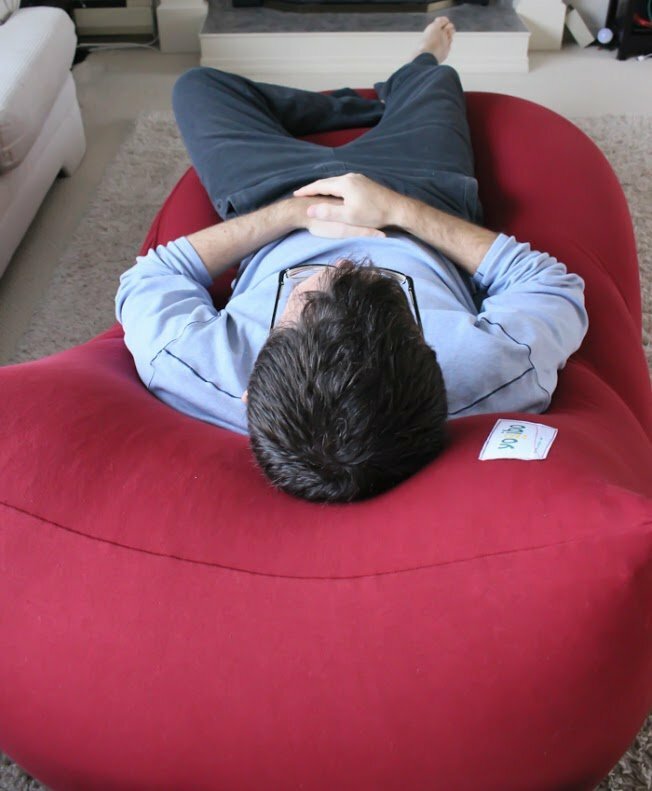 Luckily, Yogibo makes beanbags of varying sizes including the Midi and the Mini. Even the Max is so so light that moving it around isn’t a big deal. Yogibo also makes pillows, bean bag animals and UV resistant outdoor beanbags. Judging by how much we like the Yogibo Max, I can see a Yogibo roll somewhere in our future. For now our single Yogibo Max will get all the attention and be the object of as much jealousy and reckless enjoyment as a beanbag can get. I for one, plan on taking a nice long nap on it. That is, if I can get my wife and kids off of it for long enough. Where to get it – the Yogibo Max on Amazon! We’re big fans of shopping by Amazon. 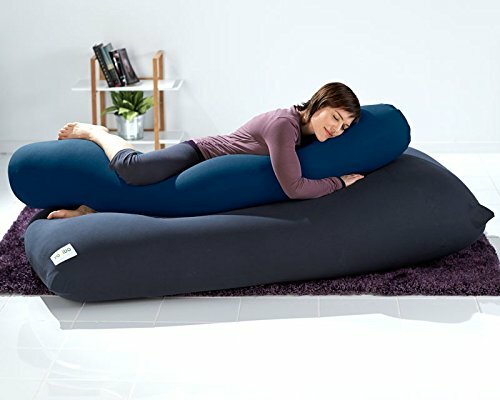 Besides the Yogibo Max, Yogibo carries plenty of different sized beanbags, including the Yogibo roll pillow, which pairs perfectly with the Yogibo Max. Great article! I’m looking to buy a couple… How are yours holding up? I wonder how long they’ll last without needing parts replaced. Thanks! Actually, ours is holding up awesome and it’s used every single day we’re home! We pull off the cover and wash it every few months and we just topped up the “beans” yesterday for the second time since they do tend to get squished after a while. We got our extra fill from Walmart just because it was easier for us. I think they’re not as good as the existing ones however once they mix up with the old ones, the bag feels just like new again. It was definitely a great purchase for us and we still routinely have people asking about it.